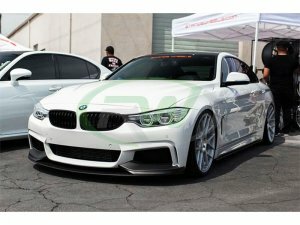 Do you love the design of the M Performance Front Lip Spoiler for the BMW F32 F33 and F36 models, but do not want to spend a fortune to have it? RW Carbon has you covered with our new Performance Style Front Lip Spoiler in Polypropylene; a more durable and affordable option when compared to our carbon fiber version or the OEM piece. Being made of polypropylene (a very durable and lightweight plastic material) this lip is unlikely to crack and carries RW Carbon's fitment guarantee. These front lip spoiler fit all 428i and 435i M Sport models.